A rectangular granite marker commemorates the 39th Confederate Reunion. The inscribed horizontal stone is flanked by slightly higher vertical slabs. Confederate flags are embossed on both of them, on front and back. The memorial includes a time capsule holding the minutes of the 1929 reunion. The planning committee for the monument consisted of: Richard B. Stitt (chair), Dr. Addison Brenzer, H. Grady Moore, J.A. Daly, and Leardy Adams. Funds were raised by donations. Dr. Albert Sidney Johnson was the presiding officer. While the Fort Bragg Military band provided music, Dr. E. N. Orr, provided the invocation. The main address was given by Dr. Oren Moore. The monument was unveiled by great grandson of Stonewall Jackson and granddaughter of William Morrison Stitt. Former Mayor Redd, who introduced Moore, proclaimed the monument demonstrated reunion had occurred in America. A copy of the records of the reunion and list of attendees was sealed inside the monument. The oldest living veteran present was tasked with placing the records in the monument. The Rev. John Long Jackson gave the benediction. The ceremony was reportedly filmed by Pathe News. A marine corp bugler, Arthur S. Whitcomb played taps at the end. The monument was presented publicly on June 7, 1929 – a day before the 68th anniversary of North Carolina’s 1861 secession from the Union. Mecklenburg native Richard Battle Stitt raised the money to produce the memorial. Stitt’s father, William Morrison Stitt, served in the Confederate Army and had been wounded at the Battle of Chancellorsville in May 1863. In July 2015, the monument was defaced with cement after the murder of nine black parishioners in a historic black church in Charleston, SC. The overtly racist language on the monument has led to calls to remove it. The memorial is located on North Kings Drive, on a hill next to Grady Cole Center and American Legion Memorial Stadium. 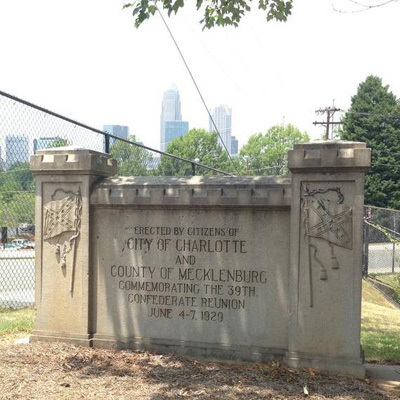 It was on city property until Mecklenburg County’s park and recreation department merged with the city’s in 1991. It sits right by a tall wire fence under shady trees. Know anything else about this monument that isn't mentioned here? If you have additional information on this or any other monument in our collection fill out the form at the Contact Us link in the footer. Thank you.